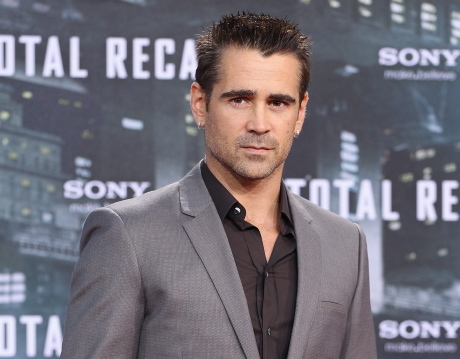 Colin Farrell star of "Total Recall"
The 'Total Recall' actor - who has battled with drink and drug abuse in the past - admits he has memory loss for certain parts of his past but insists he's not bothered about it. He said: "There are a few black holes, where minutes and hours and days and weeks and possibly months have vanished. But whatever's disappeared I'm fine with, I obviously don't need it. As for things I'd like to forget? I don't think there's any." Colin - who has two sons, James, eight, and 22-month-old Henry, from previous relationships - also said how he would have loved to have been soccer legend George Best in his heyday. The Manchester United winger - who died in November 2005 because of complications from the immunosuppressant drugs he needed to take after being given a liver transplant in 2002 - was famed for his extravagant lifestyle and Colin thinks it would have been great to be the Northern Irish player in his 20s. He told Short List magazine: "I suppose if I were to pick anyone, I probably wouldn't mind being George Best, just at a certain stage when he was a young man. And I say that with all respect for where George's life went."